A fire at a budget hotel in the northern Philippines has killed 15 people and injured 12, officials say. 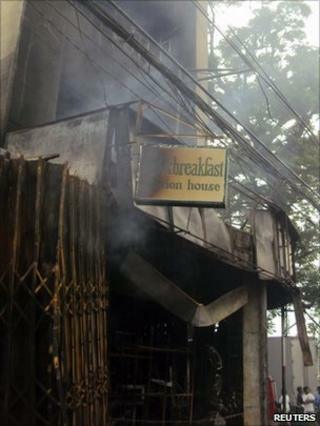 The blaze began on the ground floor of the five-floor hotel in in the city of Tuguegarao, in Cagayan province. It burned for several hours, gutting the building. Most guests were asleep when the fire began but dozens were rescued or managed to escape. Nine of those killed were reported to be nursing students who had been preparing for a licensing exam. However, investigators believe that it was fuelled by car tires and other combustible materials stored in a room on the ground floor. Some firefighters wept and prayed as they retrieved the bodies of the dead. "Their families spent fortunes to send these children to school, only to see them end that way," an official said. Remains of the victims - some of them burned beyond recognition - were later brought to a local morgue. The students who survived the blaze went on to take the exam later on Sunday, including one who turned up in slippers and sleeping clothes, according to the Associated Press news agency. Correspondents say hundreds of people die each year in fires in the Philippines, where many buildings are built with inflammable materials, and narrow streets often make access for firefighters difficult.